Brittany is one of the most distinctive and beautiful regions in France with a unique character, intriguing history and 1,200km of dramatic coastline. Each year, over a million holidaymakers hop across the Channel to enjoy the stunning scenery, Breton lifestyle and charming hospitality. The landscape in Brittany is diverse, with a rugged northern coastline, sophisticated beach resorts in the south and beautiful offshore islands to explore. Bordered by the English Channel and the Atlantic Ocean, Brittany is gently warmed by the Gulf Stream, giving it a very mild climate – perfect for outdoor enthusiasts. Enjoy the elements and invigorating sea air on miles of coastal paths – walk or cycle as you admire the surrounding scenery. Brittany’s strong cultural heritage is key to its appeal – a mix of Celtic traditions and medieval history. And of course, no visit to Brittany would be complete without sampling the delicious cuisine on offer. Specialities include seafood and crêpes – both can be washed down with a glass (or two) of tasty Breton cider. Many visitors arrive in Brittany through the port of St Malo. The attractive walled town is the most visited place in the region, and not just because of the ferry terminal. Wander along the café lined streets of the old town or explore the ramparts. The views are wonderful, particularly at dusk as the sun sets. If you’re travelling with children, the Grand Aquarium featuring over 500 species of sea life is not to be missed. There is an exciting touch pool where you can get up close and personal – although hopefully not with the aquarium’s sharks! Cancale is famed for oysters. East of St Malo is Cancale, famed for its oysters. There is no better place to sample this delicacy – dine any one of the numerous restaurants on the seafront. The oysters are farmed in the bay not far from your table and are the largest and juiciest in France. A tasting doesn’t need to blow your budget either – the abundance of oysters and restaurants keep prices competitively low. On the northern coast, between Normandy and Brittany is the magnificent medieval abbey church of Mont-St-Michel. Located on a rocky island you’ll be amazed at the architectural masterpiece standing defiantly above the ocean. The UNESCO World Heritage site is accessed by a narrow causeway which is covered at high tide. Take note of the warnings in the car park or you may return to your car floating in the sea! The monument is open to the public all year round, and in July and August you can enjoy ‘Les Imaginaires’ tour which allows you to explore at night. Dol-de-Bretagne, 30 minutes from St Malo, is a good base for exploring the area. A charming medieval town, Dol has cobbled streets, half timbered houses and is surrounded by its original ramparts. Discover the gothic architecture of 13th century Cathédrale St-Samson which dominates the town’s skyline. Nearby is one of France’s finest campsites: Domaine des Ormes. Offering self-catering accommodation in a beautiful parkland setting you can holiday in a spacious tent, mobile home or fairytale-esque Woodland Lodge. 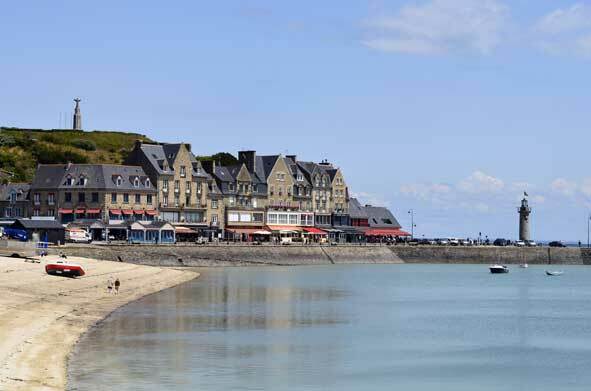 West from St Malo, the Côte d’Émeraude consists of traditional family resorts, seaside towns and sandy coves. There are many well positioned campsites including tranquil Camping le Châtelet at St Cast, from where you can discover the best of Brittany. Brittany’s coastal landscape changes as it reaches its northernmost point and develops into stunning pink granite. Known as Côte de Granit Rose, the most popular resort along this coast is Perros-Guirec. Perros is a small but lively town with a large marina, casino and sweeping beaches. The best of these is Plage de Trestraou with golden sand and clear blue water safe for swimming and diving. There are a few good bars and restaurants along the waterfront – make sure you try one of the traditional crêperies. With the fantastic choice of regional food and drink available it is easy to overindulge. However, there are plenty of opportunities to walk it off, and there’s nothing quite like a warm sea breeze to revitalise you. Pointe du Raz is a perfect spot – the ‘lands end’ of France is Brittany’s most western tip and sits on a rocky outcrop above the sea. Listen to the roar of the surf below as you walk and take in the dramatic views of the Atlantic Ocean. The most popular destination for French and British holidaymakers is Brittany’s southern coast. It boasts long stretches of sheltered sandy beaches and sophisticated resorts, where the water is ideal for swimming and water sports. Learn to sail a catamaran or make the most of the waves with a surf or body board. One of the best beaches is near the bustling resort of Bénodet. Here, the long golden beach is great for children and has lots of activities both in and out of the water. Opposite the beach is Escale St Gilles, an excellent choice for a lively family holiday. From Bénodet you can take a boat excursion to the beautiful Îles de Glénan. Situated ten miles off the coast, these unspoilt islands have long sandy beaches and amazing scenery – home to a bird sanctuary and wildlife reserve. Follow the coast east and you’ll reach historically important Carnac. Renowned for its megalithic remains, you can see over 2,000 prehistoric menhirs (standing stones). They range in size from stumps to five metre high blocks and are arranged in three alignments pointing with great accuracy toward the point of the compass. Breton tradition claims the reason they stand in such perfectly straight lines is that they are a Roman legion turned to stone by Arthurian wizard Merlin. However, most people today believe they are of a religious significance, connected with their use as some sort of astronomical observatory. Whatever your theory they are an amazing sight and definitely worth a visit. Away from the stones is the bustling seaside resort of Carnac-Plage with a choice of five beaches, shops, bars and restaurants. 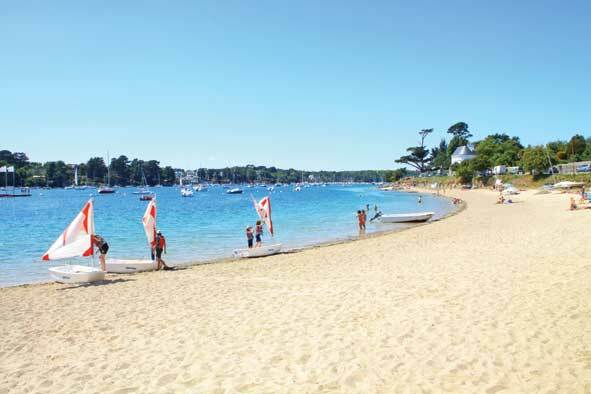 Camping la Grande Métairie makes a great base to discover southern Brittany. The campsite enjoys a countryside location and Canvas customers have been holidaying here for over 30 years. There are many different sides to Brittany and the region truly has something for everyone. Whether you are visiting for the first time or a seasoned traveller I can guarantee you’ll be back. 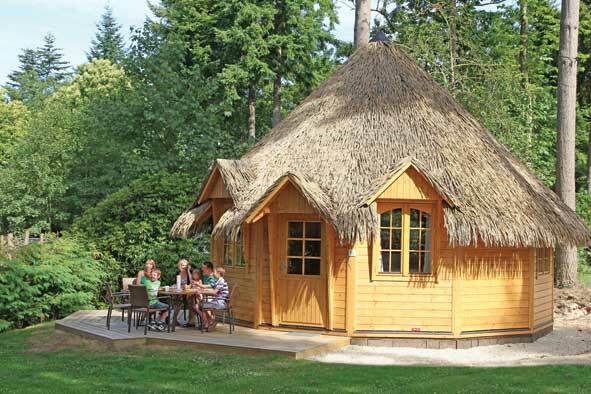 Canvas Holidays have a choice of six campsites in Brittany. How much are the world’s best beaches really worth?